One of the things that Josh will always remember was when “Mrs. Burton threatened to fail me if I ever stopped writing,” because its such an unusual encouraging method from an English teacher. 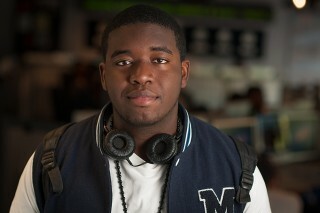 Josh is a 6’3” senior at Baldwin High School who was born in Bedford Stuyvesant, Brooklyn. In his early childhood he moved around a lot from Brooklyn to Manhattan and eventually made his way to Long Island. He went to Catholic schools until fourth grade and then went to New York City public schools. His teacher then even introduced Josh to the writings of Jack Kerouac and James Joyce. Josh submitted his first news article for a school paper in 10th grade which was about two of his friends who had recently moved to his town of Baldwin from Haiti after the devastating earthquake of 2010. He was thrilled seeing his name on the school newspaper. Josh is planning on double majoring inPre-Law and Political Science at Baruch College because of the good law and political science programs.” Although journalism is not his main career goal the journalism background goes hand in hand with law. “All the things I do are to make my mom happy,” Josh said.